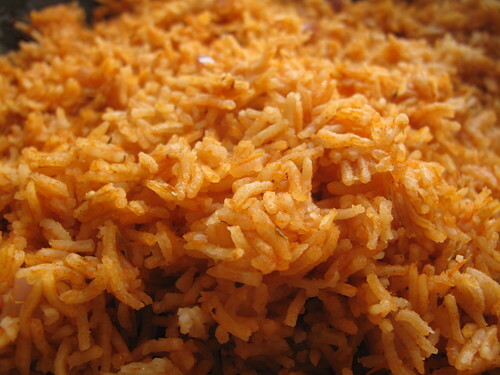 And the answer is yes….sometimes, Jollof Rice has crayfish (dried shrimps) in it, depending on who makes it. I skip it in mine…not liking fishy rice! I shared with him a coconut jollof version I had on food52. 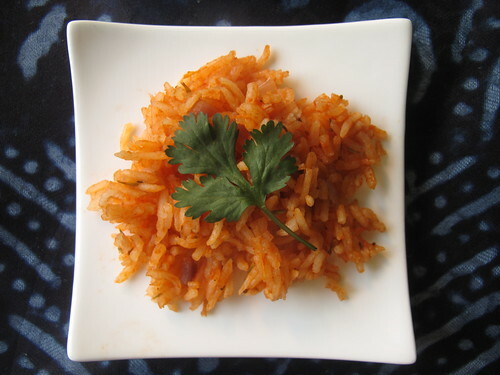 And so, as a tribute to both of them, and you as well, this is Jollof rice… in all of its tomatoey goodness and glory! Uses fresh ingredients: Few Nigerians use tomatoes out of a tin, most people buy fresh from the markets, as they do other ingredients. 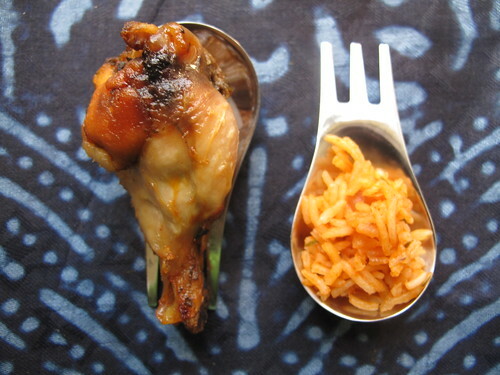 Can be ‘spicy’ without chilli peppers: Nigerian seasonings don’t always involve chilli peppers. 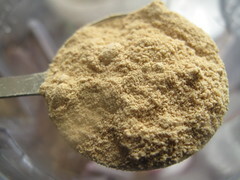 Curry, dried thyme, ginger and garlic are used to flavour meats, rice and stews. Of course, chilli peppers are a key ingredient but not everyone uses them. You will also find fresh curry leaves and other herbs available to cook. Carbs accompany most meals: Rice and other flours form the chunk of every meal. Yams, plantains, sweet potatoes and ‘Irish’ potatoes are important! Love meat and fish. I remember once, I served a friend of my husband tiny chunks of meat (I was practising a style of cooking) in a soup. Hmmm, the look on his face when he saw the size of the beef was far from complimentary…..as were the words that followed: ‘Is there no meat in the soup?’ I didn’t consider it that rude because I understood where he was coming from! 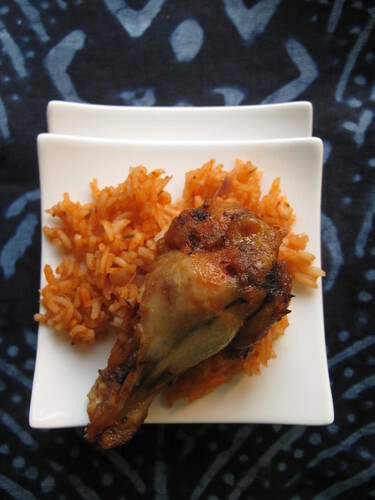 Jollof rice, like Fried rice (Nigerian-style) is one of those dishes in the hall of fame. No wedding, funeral, birthday party is complete without it….and certainly not Christmas. It is almost always served with chunks of fried beef and chicken, Dodo and maybe coleslaw. 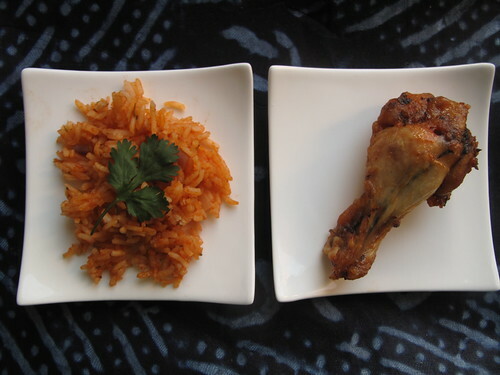 At home in Nigeria, it is always made with parboiled long-grain rice like Uncle Ben’s. According to Wikipedia, Parboiled rice is rice that has been boiled in the husk. Parboiling makes rice easier to process by hand, improves its nutritional profile, and changes its texture. Polishing rice by hand, that is, removing the bran layer, is easier if the rice has been parboiled. It is, however, somewhat more difficult to process mechanically. The bran of parboiled rice is somewhat oily, and tends to clog machinery. Most parboiled rice is milled in the same way as white rice. Parboiling rice drives nutrients, especially thiamine, from the bran into the grain, so that parboiled white rice is 80% nutritionally similar to brown rice. Because of this, parboiling was adopted by North American rice growers in the early 20th century. The starches in parboiled rice become gelatinized, making it harder and glassier than other rice. 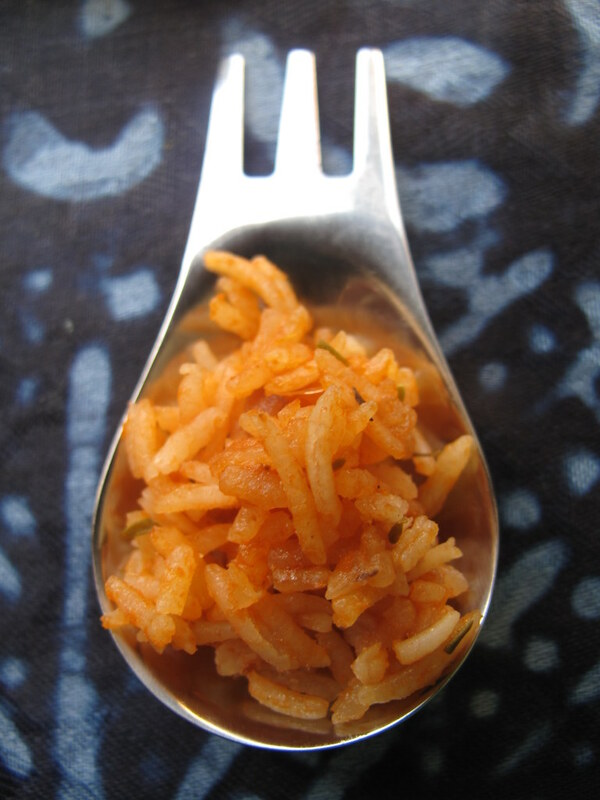 Parboiled rice takes more time to cook, and the cooked rice is firmer and less sticky. In North America, parboiled rice is generally partially or fully pre-cooked by the processor. Now just like the Japanese do with sushi rice, the rice is gently washed till the water runs crystal. Then it is boiled for about 10 minutes, to partially cook the rice, again. Then the cooking begins. One might begin with some oil and butter, heated up. 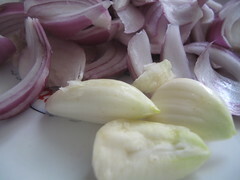 Sliced onions may be added and slowly fried. Often, a tomato mixture, made up of blended onions, tomatoes and chilli will be added. This will be seasoned with curry and thyme, salt and maybe Maggi cubes. Whatever is done, the key to tasty Jollof is in the seasoning. Being in the Netherlands, for some reason, I started making my Jollof with Basmati rice and haven’t stopped since. While I don’t parboil it, I pre-soak it for at least 20 minutes before I cook with it. It does taste quite different and I guess it is a bit more delicate than using parboiled! Though a lot of Nigerians make it on the stove-pot, when cooked for large occasions, it is made on a wood fire and the taste is amazing! Smoky and spicy…all the same. Cook the rice on low heat, don’t over stir and don’t add too much liquid at a time. 800ml water or stock (vegetable, chicken or meat) – see stock recipe below! Optional – mixed herbs, shrimps (fresh or dried), meat chunks etc…. 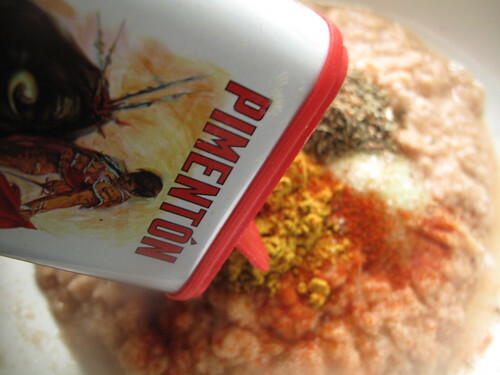 In a blender, blend tomatoes, 2 onions and chilli pepper until smooth. This will take about 2 minutes of pulsing in a blender. In a large pan, heat oil and add the sliced onion; stir-fry for 1-2 minutes; add blended tomato mixture, tomato puree, curry, thyme and season with salt. Stir on medium heat for 10-12 minutes so the mix cooks and the raw taste of the tomatoes is gone. If using, add water/stock. Stir well, season to taste and add rice. Stir again. Cover pan and bring to the boil. When it comes up to the boil, add butter, stir again and turn down the heat – letting the rice steam for another 15-20 minutes, or till cooked (depending on how you like your rice). 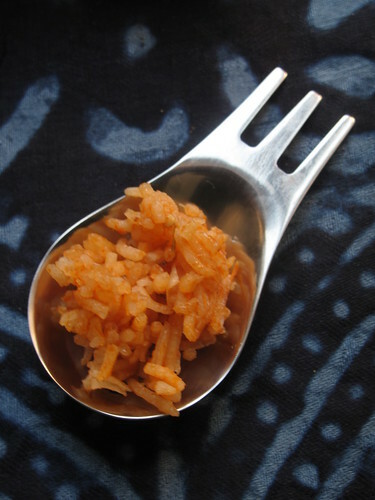 If rice is getting too dry, add some more stock or water, stir gently and leave to cook. Note that when cooking, the rice may stick to the bottom of the pan…..and even burn. 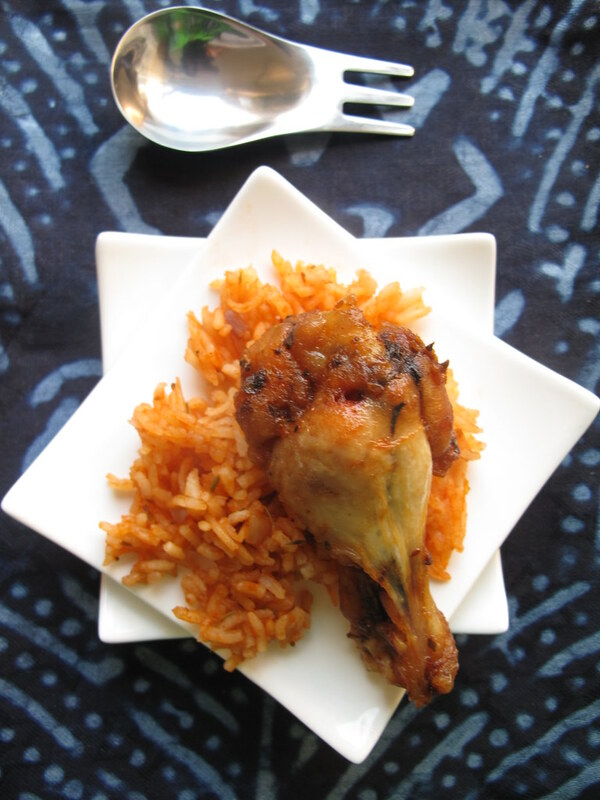 Now, some in Nigeria consider this the best part of the meal…..scooping up every burnt grain onto their plates. 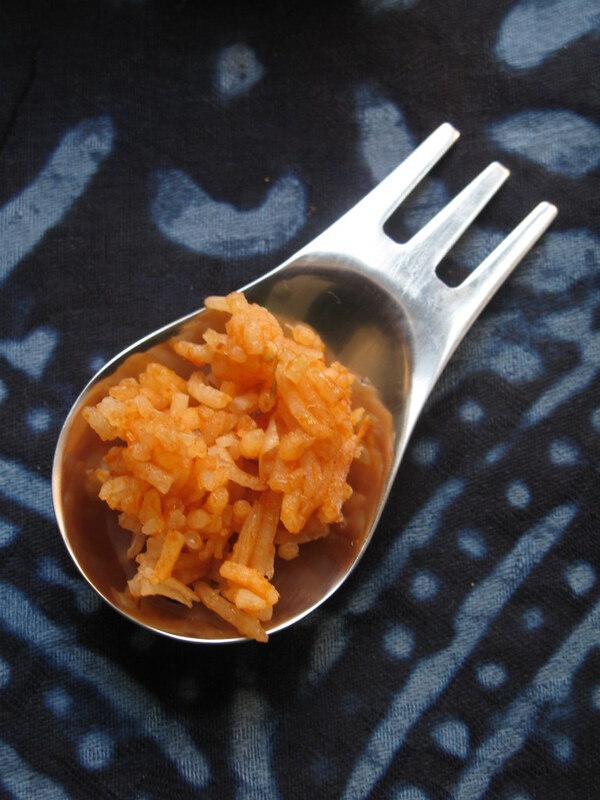 I must admit that sometimes, it lends a smoky, bbq-like flavour to the rice, as though it were cooked outside! Omit the chilli and in addition to the ingredients above, add 2 large carrots (roughly grated) and 1-2 cups of lean minced meat. If the mincemeat is really lean, add at the start of stage 3 to chopped onions and continue with the rest of the steps. If it is not lean, precook before hand and add to stage three. You could also use left-over meatloaf! 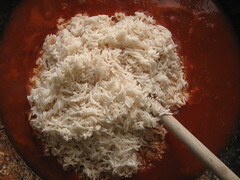 Add 1 tin of coconut milk (about 400ml) and half of the stock after cooking the tomato mixture. It is possible to make kids/adults version with or all of the ingredients – carrots, coconut milk, minced meat… it depends on what you like. Garnish with slices of green peppers and cilantro (coriander) leaves. 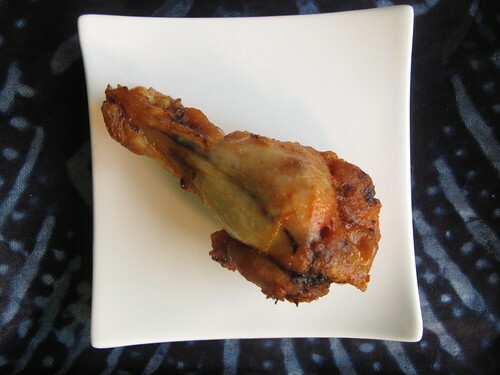 Serve with fried plantain (dodo) or sliced bananas and meats (or not) of your choice. I love it with boiled or fried eggs. Blend Onions, garlic (and fresh ginger, chilies, if using) without water in a blender. 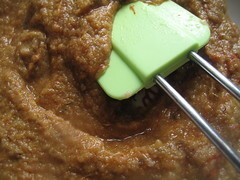 Do it in pulses and if it is difficult, open the blender and mix the contents with a spoon. When ready put onion mixture into a large bowl. Add chicken to spice mixture, making sure chicken pieces are well coated. Then cover the bowl with the cover or Clingfilm and leave in the fridge to marinade for 24 hours. 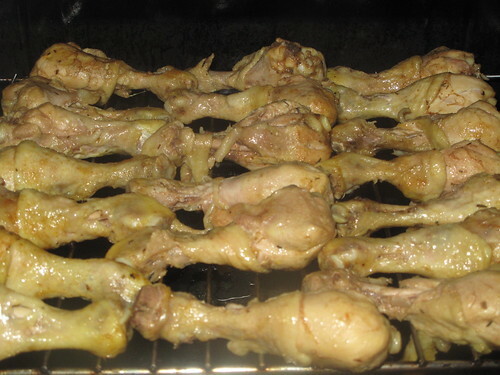 Let chicken steam for 15-20 minutes (The point is not to cook it through). Stir often when steaming to ensure it doesn’t burn. When steaming is done, put on a baking rack or in a pan and bake/grill to desired brownness, turning a couple of times to ensure even cooking! To make stock: Add about1/2 – 1 litre of boiling water to the mixture, which is left after the chicken is cooked to make the stock. Strain in a sieve and throw residue in sieve away and keeping the liquid for the Jollof rice! Have a blessed start to a short week…..and long weekend!